Triple Olympic gold-medallist Usain Bolt cruised to victory in the fastest ever time run over 150m to light up the Manchester street race on Sunday. Bolt roared home in 14.35 seconds, smashing the previous best recorded by Italian Pietro Mennea of 14.8 in 1983. Britain's Marlon Devonish finished a distant second in 15.07 secs. In the women's race American Debbie Ferguson-McKenzie clocked 16.54 secs to beat Olympic 400m gold medallist Christine Ohuruogu, who ran 17.10 secs. What did you make of Bolt's performance? "It felt great. I am glad a little bit of sunshine came out, it made me feel 100% better," Ferguson-McKenzie told BBC Sport. "It was awesome and it was fun. The concept is awesome, the crowds were really excited and I loved it." Bolt, 22, was competing for the first time since being involved in a car crash last month. 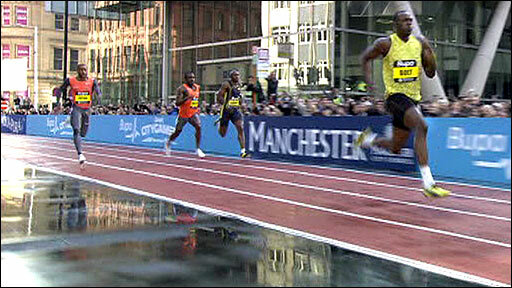 But the Jamaican 100m and 200m world record holder showed no ill-effects, cruising to victory in rain-soaked Manchester. Hundreds of fans lined the route in the narrow street bisecting the city to see the one-off race, and despite the poor weather they saw a stunning performance from Bolt, who ran the last 100m in 8.72 secs. "It's one more record to add to the tally isn't it?" Bolt told BBC Sport. "It's my first major competition of the season so I was just happy to come out and run injury-free and run a good time. "I am not in the best of shape, I still have a lot of work to do. I have been on and off in my training but I am getting there. I just want to put some hard work in." Devonish could only marvel at Bolt after being left trailing in the Jamaican's wake. "It was a great run by Usain, phenomenal. 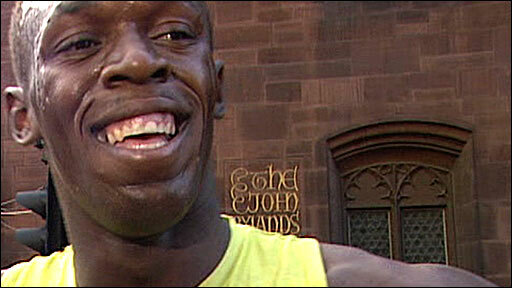 If he had maintained that pace (over 200m) he would have run a 19.3 (the world record time he ran in Beijing)," he said. "That shows you what shape he is in, especially in this kind of weather. He is in a league of his own."